The foundation of our lifestyle financial planning philosophy consists of lasting trusted relationships with our clients. We go through a process to understand you as well as your financial situation, lifelong dreams, goals, and needs. This enables us to offer a fully bespoke solution. 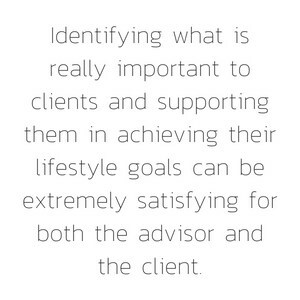 Lifestyle goals are personal and 97% of clients walking through our doors do not have clear documented goals. We lead you to formulate clear documented goals and in most cases, it will take a few years to cement your goals. The most important part of our service is understanding our clients. Because we are fully independent your goals dictate the solution we recommend 100% of the time and our advice is always wrapped in layers of care. Our financial planners are professionally trained and qualified. It is a requirement that our planners are Certified Financial Planners® and members of the Financial Planning Institute or in the process of obtaining the qualification. This enables us to provide you with expert advice bearing in mind the effect on tax, relevant legislation, and professional practice. We partner with the best discretionary asset managers in the business to ensure that our recommended investment strategy are more likely than not to beat its benchmarks. We coach you to achieve a positive Return on Life (ROL) ratio. Unlike Return on Investment (ROI), this ROL ratio determines the success in building relationships, rewarding experiences and the sense of purpose. Through this, we aim to enable you to have a truly meaningful life.